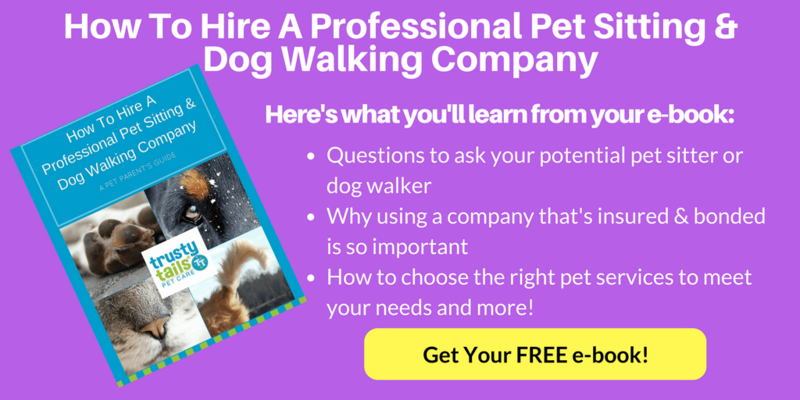 You are here: Home / Hiring a Dog Walker / How Do I Know My Dog Walker Walked My Dog? Can’t get in touch with your dog walker? Do you rush home to let your dog out because you aren’t sure your walker came to walk your dog? Always wondering what that note on the counter at home from your walker says? With Trusty Tails, you don’t have to wait until you get home to find out that your dog was walked. With today’s technology, we make it easy for you to know as soon as it happens. In this article, we answer “How do I know my dog walker walked my dog?” by a Trusty Tails Walker. With Trusty Tails’ online system, scheduling and communicating is as simple as pressing a button. Simply schedule your appointment and receive and email confirming your request once we approve it. You never have to worry that someone didn’t write down your appointment time. Once we’ve confirmed your request, it’s all set from there. Upon arrival, your dog walker will arrive within your chosen time frame and check in via GPS tracker to begin the visit. Once the walk is completed, our staff will check out with the same GPS method they used at the start of the visit. This will be included in the pet care note we send you. Forget to let your walker know to give your dog lunch or some medicine? No worries. No need to pick up the phone and call the office (though we would love to hear from ya. With our system’s technology, you are able to directly communicate via text message in our system with your walker who is scheduled to walk your dog. . It’s that simple. A standard walk lasts for approximately thirty minutes, though this may be altered slightly due to extreme weather conditions or your dog’s specific needs. Your walker will send you a personalized message about everything that happened during the walk. This note includes a time stamped map, checklist detailing bathroom habits, weather, medications given, and photos. The pet care journal entry that you can view at any time from your online account. All of this is wrapped up into one neat email and sent directly to you to view at your leisure. Each of these emails is kept in a Pet Care Journal in a calendar format in your account for you to go back and review any time you would like. Don’t panic if you haven’t gotten an email and the thirty minutes of your dog’s walk are up – many of our walkers and sitters enjoy spending extra time with your pet when they can, so more than likely, they’re just going above and beyond by giving your dog all the love and play he deserves. If there’s ever an emergency, we’ll call you directly, but otherwise we stick to emails and comments within our online pet care portal. That way, you can revisit your favorite funny journals and cute pictures whenever you’d like! You’ll know right away that your dog has had a good walk as soon as he greets you with all his usual excitement when you get home, but slightly less jumping and running in circles. All the energy he normally has pent up was exerted during his midday outing, leaving lots of love for you to receive without exhausting you. Now that you know the answer to “How do I know my dog walker walked my dog?”, you can have an easier day and not worry about rushing home to walk your dog. When you arrive home, you’ll know right away that your dog has had a good walk as soon as he greets you with all his usual excitement, but slightly less jumping and running in circles. All the energy he normally has pent up was exerted during his midday outing, leaving lots of love for you to receive without exhausting you. Then, just wait for bedtime…he’ll be snoozing before you’re done brushing your teeth! If you’re in need of a local dog walker that you can trust and don’t want to stress about whether or not your dog was walked, we’re the company for you. You can reach us at 201.446.1559 or contact us through our website. We look forward to hearing from you. How Long Is A Dog Walk? Next Post: Will My Dog Walker Let My Dog Off-Leash?